The Slum... an area of town completely forgotten. No one could imagine the cruelness suffered by innocent people who were transformed into horrible mutant creatures by genetic experiments. They hovered everywhere and completely took control of the town. Mutation Nation is a 1-2 player action game where you must control your hero and beat up any mutant that gets in your way, by either using your fists or one of four special attacks. A boss at the end of each area needs to be defeated if you want to proceed further through the game. 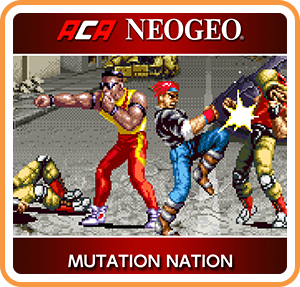 Where can I buy ACA NEOGEO MUTATION NATION physical/digital?